Product prices and availability are accurate as of 2019-04-26 03:01:46 EDT and are subject to change. Any price and availability information displayed on http://www.amazon.com/ at the time of purchase will apply to the purchase of this product. Whether you need portable power for multiple weeks at base camp, an entertainment charging station during a family camping trip, or carbon-neutral peace of mind for emergencies, the Goal Zero Yeti 1250 with Boulder Briefcase Solar Kit gets the job done. 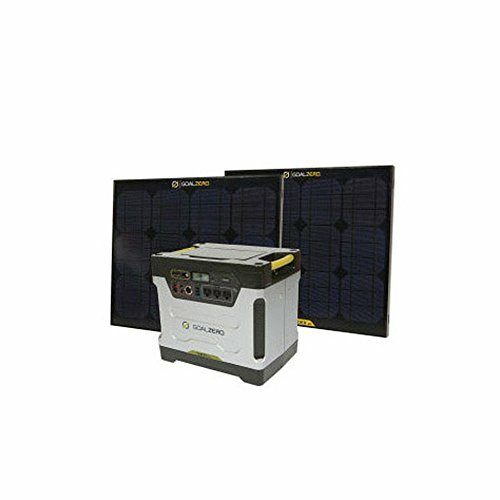 This kit features the behemoth Yeti 1250 Portable Power Station along with a durable, high-capacity Boulder 100 Briefcase solar panel to deliver massive amounts of rechargeable power to your campsite, cabin, or home. Able to power numerous devices, ranging from full-sized refrigerators to camp lights and mobile electronics, the Yeti 1250 features three 2. 1-amp USB outputs, a 12V output, and three wall-style AC outlets. The 1250-watt power bank charges a laptop over 20 times, smartphones over 60 times, and GoPros and headlamps over 200 times. Since it's an AGM battery, you'll want to keep it plugged in at all times at home, and keep it plugged in to the Boulder 100 at all times when you're in the field. Providing an accurate readout of power usage, the large screen displays incoming and outgoing power, so you're never unexpectedly left in the dark. 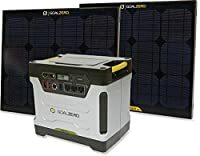 The Boulder 100 is technically two Boulder 50 solar panels pre-chained together and connected with a hinge to make it ultra portable and convenient. It's built with strong tempered glass and an aluminum frame with added corner protection for serious durability. It features the addition of a carrying handle and integrated kickstand for convenience. In fact, it's durable enough for permanent installation on your cabin or tiny home if you decide to leave the grid completely behind.